TYA representatives with the trophy they won at the national Agricultural show. 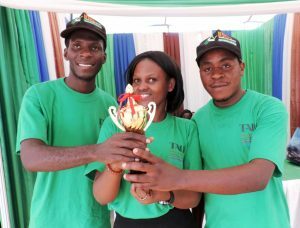 The IITA Tanzania Youth Agripreneurs (TYA) have received a trophy for being good ambassadors for young people through their efforts to tackle unemployment through agribusiness. This was during this year’s National Agricultural Exhibition dubbed ‘Nane Nane’ held from 1 to 8 August in Lindi, Tanzania, which they participated in showcasing their activities and products. The award was given by the Tanzania Agricultural Society (TASO) in recognition of the TYA’s effort, commitment, and active participation during the exhibition. “The trophy is an inspiration for us. We appreciate the recognition of our efforts to encourage youth to fight poverty in the country through agribusiness,” said the TYA Communication Officer Ndibalema. “It was such an amazing experience for us. This was our first time of participating in such a big, countrywide exhibition” he said. 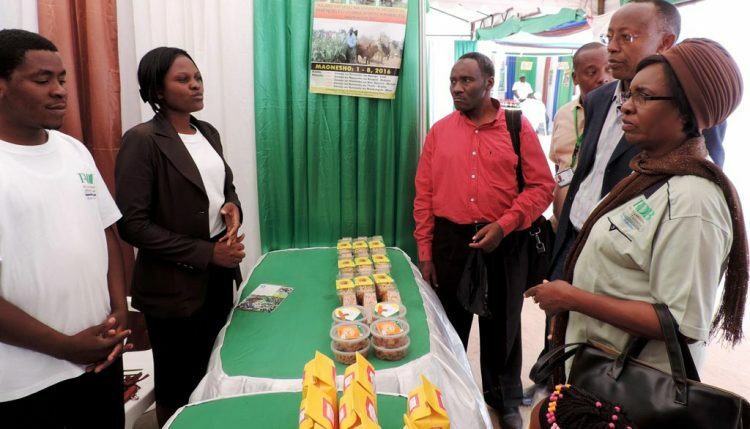 The youth showcased some of the products from their small-scale cassava and soybean processing centers located at Kwembe and Mikocheni, Dar-es-Saalam, Tanzania. These included High Quality Cassava Flour (HQCF) and its products (cassava flour, cassava chin chin, cassava strips, and visheti) and soymilk. The group’s exhibition booth attracted high level dignitaries who included Florence Turuka, Permanent Secretary in the Ministry of Agriculture, Livestock and Fisheries; Rosebud Kurwijila and Thomas Samkyi, Board Chair and Managing Director of Tanzania Agricultural Development Bank (TADB), respectively; and Nicomed Bohay, Managing Director of Private Agricultural Sector Support (PASS). youth on their activities and products. Kurwijila promised to continue to support TYA to successfully meet their set objectives. She said youth participation in agriculture development programs in the country was necessary to catalyze the country’s efforts to fight poverty, hunger, and unemployment challenges. TADB has been supporting the youth in building their capacity to write proposals and business plans to tap into funding opportunities for youth programs. The financial institute will further look for areas to strengthen financial support for the project’s activities. The group also benefited a lot from the whole experience, from learning about new technologies and innovations they could add to their ventures, to networking with potential partners including financial institutions. The theme of this year’s “Nane nane” exhibition by TASO was “Kilimo na Uvuvi, Kijana shiriki kimailifu, Hapakazi TU” or “Agriculture and Fisheries, Youth Efficiency Participation, here it is work only”, borrowed from the campaign slogan of the current President’s government. The group participation at the event was made possible through funds from IITA and TADB.